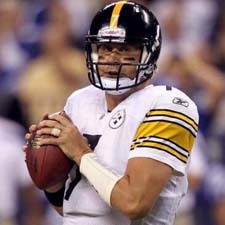 The Super Bowl winning quarterback of the Pittsburgh Steelers needs to be fired! He is consistantly not performing. He did well in years past because of the support around him. Now, however, his front line has injuries mixed with newbies that are still learning their way in professional football. Now that Ben does not have as many of the seasoned vets around him reality is hitting Pittsburgh – Ben Rothlisberger is not a good quarterback. This entry was posted in Sports and tagged Ben Roethlisberger, Football, National Football League, NFL, Pittsburgh Steelers, Sports, Super Bowl by hernandiesel. Bookmark the permalink.